2018 Fall Conference: Professional Development in Las Vegas. 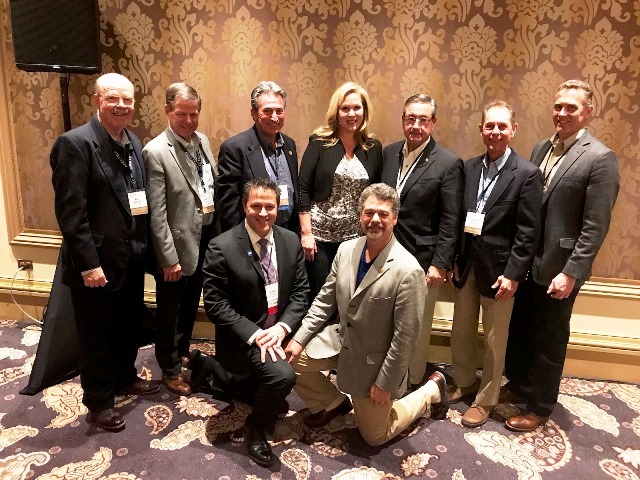 On October 31 - November 2, ACEC New York members attended the 2018 Fall Conference at the Bellagio in beautiful Las Vegas, Nevada. The ACEC New York conference was held immediately following the ACEC National Fall Conference, so many members were able to experience both of these excellent events. Attendees experienced a number of unique sessions, including presentations on risk management, design-build, computational design and virtual reality, and many more exciting subjects. Members also heard from new ACEC National President & CEO Linda Bauer Darr, as well as ACEC National Vice President of Government Affairs, Steven Hall. Presentations from this event are available on the Members Only section of our website. Thank you to our Silver Sponsors, ACEC Life/Health Trust and L'Abbate, Balkan, Colavita & Contini, L.L.P., as well as our program sponsors A/E Clarity, Greyling Insurance Brokerage, L'Abbate, Balkan, Colavita & Contini, L.L.P., Marshall Dennehey Warner Coleman & Goggin, P.C.,and Rusk O’Brien Gido + Partners. Past and current ACEC New York Chairs pose with new ACEC President & CEO Linda Bauer Darr and ACEC New York President & CEO Jay Simson. 2018 Engineering Excellence Judging. 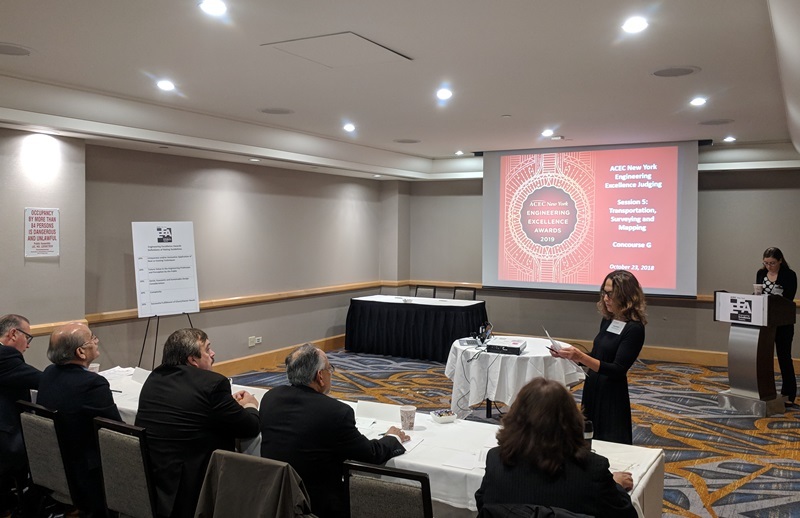 On October 23, 2018 at the Midtown Hilton in New York City, 130 Engineering Excellence final projects were evaluated by six panels of judges, which were made up of key people from the engineering industry. Each project was presented to the judges by a volunteer moderator. Participants included members of the EEA committee, principals and other volunteers from member firms, as well as key figures from the media, engineering education, and government agencies. Results have been tallied, and all firms have been notified of their award levels. Congratulations to all the award winners - a full list of all winning projects is available on our website. Tickets and tables, as well as sponsorship, are available through our sponsorship guide. Room Captain Nicola Belzer (Hardesty & Hanover) prepares the EEA judges in the Transportation/Surveying and Mapping room. Charles Gozdziewski Named ACEC Chair-elect. Charles Gozdziewski of Hardesty & Hanover has officially been nominated to be Chair-elect of ACEC National. If elected, Gozdziewski will be ACEC National Chair in 2020-21, following fellow New Yorker, Mitch Simpler. Since the merger in 2000, 4 ACEC New York engineers have occupied the National chair position. Congratulations to Charlie G. - we at ACEC New York look forward to working with him in this new role! Winter Conference PDH Session: Call for Entries. ACEC New York is currently looking for one-hour PDH sessions for the 2019 Winter Conference, to be held at the Albany Capital Center/Renaissance Hotel January 27-29, 2019. Firms offering presentations will be listed as "Program Sponsor" on marketing materials. If your firm has a technical course you would be interested in presenting, contact Gina Potfora at gina@acecny.org. ACEC New York Adopts Sexual Harassment Policy. Effective October 9, 2018, all New York State employers must adopt a written sexual harassment policy. The ACEC New York Board of Directors have approved a sexual harassment policy as an addendum to the Policies and Procedures document, which can be downloaded from the Members Only section of our website. In order to facilitate compliance, the Department Of Labor has issued a sample policy that can serve as a framework for a firm’s policy in most instances. Employers should review this form with their employment or HR counsel to ensure its applicability to their firm’s specific needs. 2019 Scholarship Application Now Available. The online application for students for the 2018-19 ACEC New York Scholarship is now available. A number of scholarships will provide a stipend of $2,500, as well as at least two scholarships of $5,000 each. Only students having completed either their third year of study (4-year program) or fourth year of study (5-year program) by June 2019 are eligible to receive the scholarship. Applications must be accompanied by a certified transcript and received at ACEC New York Headquarters by January 18, 2018. November 6, 2018, "ACEC New York Continues to Support ACE Mentor Program” New York Real Estate Journal.